World’s Best Baked Beans will be the last recipe you will ever make! 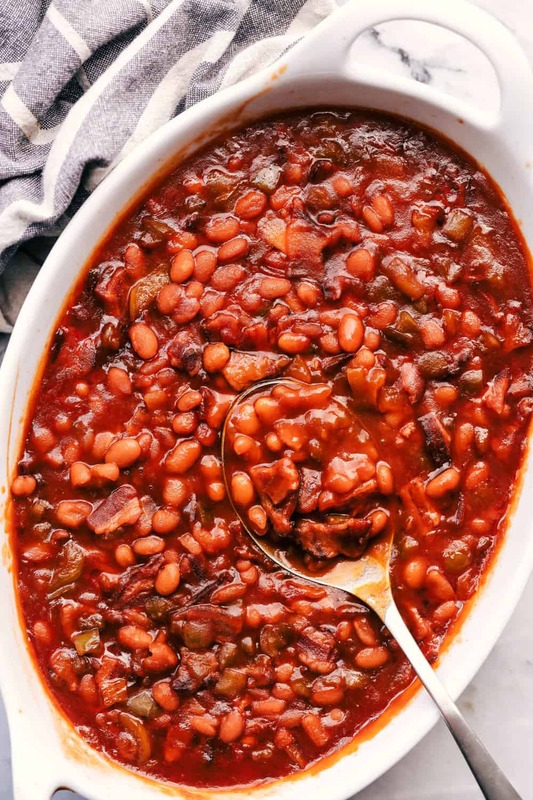 These easy baked beans are the perfect side to a potluck and a tried and true family recipe! THIS recipe my friends is a family tried and true favorite. And guess what? It has been on the blog since the very beginning. If you want a good laugh at the iPhone photo I took of it, click here. Needless to say, the picture needed a major update. My in laws introduced me to this recipe 14 years ago! And guess what? I have yet to try one that can beat it. It was adapted from the Lion House Cookbook, and people beg me to bring the beans to every gathering that we have. What makes these the best baked beans? Well for starters, the bacon. It has a pound of bacon inside of these amazing baked beans. It is also perfectly sweet with the brown sugar added, and they are thick and rich. 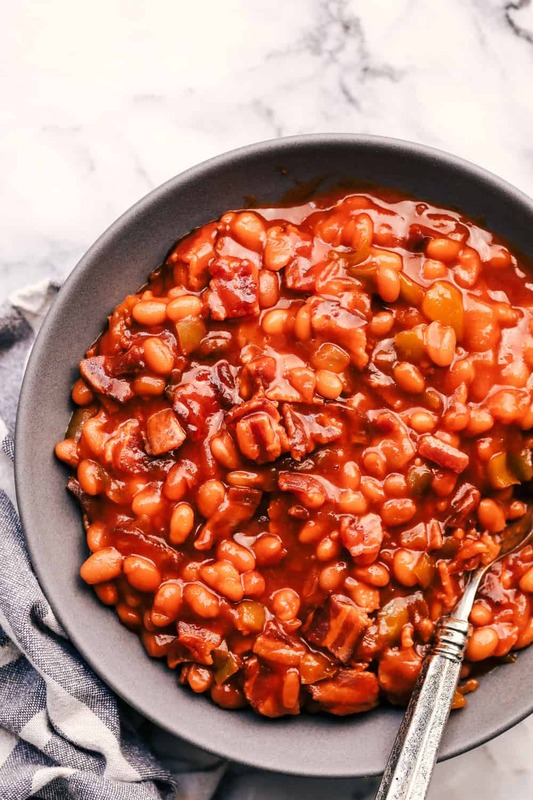 I also love these baked beans because not a lof of ingredients are required, and they turn out perfect every single time! Start by frying your bacon in a medium sized skillet over medium high heat. Once the bacon is cooked, remove with a slotted spoon and set on a plate. Remove most of the bacon grease, but leaving some to fry your onion and green pepper. Fry your onion and green pepper until tender. Combine bacon, green pepper, onion, pork and beans, ketchup, brown sugar, and worchestershire sauce in a 9×13 inch pan. Preheat your oven to 350 degrees. Cover with foil and bake for one hour until the beans thicken up and a nice crust forms on top. 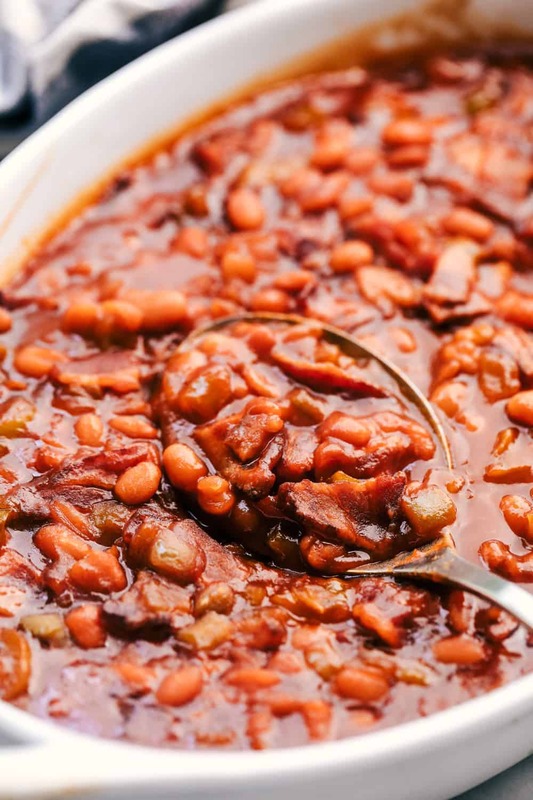 How do you make baked beans in a slow cooker? Follow the steps in the recipe and add them to the slow cooker at the end. Keep on low heat for 4-6 hours or until desired consistency. Can I make this recipe on the stovetop? Absolutely. Add ingredients to a large dutch oven and cover and simmer for an hour. Need more amazing side ideas to take to your potluck? World's Best Baked Beans will be the last recipe you will ever make! These easy homemade baked beans are the perfect side to a potluck and a tried and true family recipe! Fry up the bacon and crumble in pieces. Cut up the green pepper and onion and cook in the bacon grease until soft. Combine all ingredients together. Let simmer in pan on low for at least an hour. Preheat oven to 350 degrees. Fry up the bacon and crumble in pieces. Remove the bacon with a slotted spoon and discard some grease. Add the green pepper and onion and fry until tender. Combine bacon, green pepper, and onion, pork and beans, ketchup, brown sugar, and Worcestershire sauce in a 9x13 inch pan. Bake covered for 1 hour. You can also simmer in a large pot on the stove for 1 hour. This is very similar to what my grandmother used to do – she might not have bothered with adding onions and green peppers. 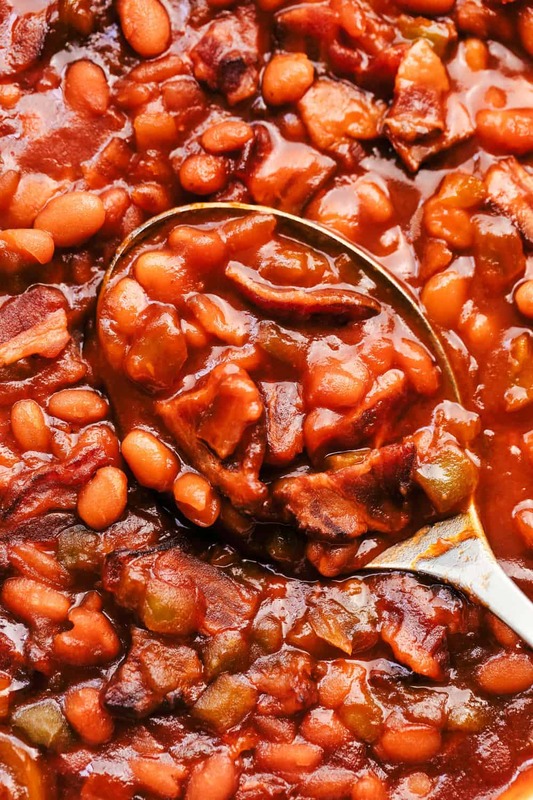 The best baked beans I’ve ever gotten at a restaurant are from a Bar-B-Que place that adds diced smoked brisket rather than bacon (although they may put in bacon also – I always ate them too fast to notice). Thanks for bringing back memories! 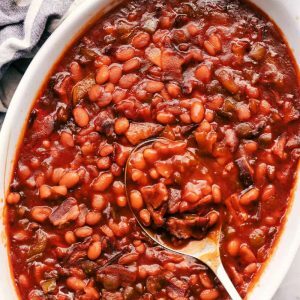 love baked beans recipes, especially since my diet requires regular legumes, and I’m kinda sick of my pinto bean recipe, so thank you for this! Have you ever used bush’s Baked beans? For some reason the pork and beans turns me off. This recipe sounds like my mom’s baked bean recipe and hers spoiled me for any other baked beans. I will try it and see if it truly measures up (which I really expect it will). I will let you know how it turns out. Thanks. These Baked Beans are the best that I had! Even better than my mom’s baked beans!!!! Thank you for the recipe. This will be our tried and true go-to recipe any time of year! Not too sweet not to sour, they are just right. Oh and don’t question the pound of bacon. I thought it was going to be too much but it wasn’t . Thank you again Alyssa!